Face-To-Face Communication Ear Muffs and Ear Plugs allow industrial workers to easily speak to and hear one another in high noise environments without ever needing to remove their hearing protection ear muffs. No microphones or radios are required, so workers may communicate naturally, face-to-face. Push-To-Listen (PTL) Electronic Ear Muffs provide a way to safely listen to co-workers without needing to remove the hearing protection to hear. When a button on the ear muffs is pressed, speech and sounds can be heard through the ear muffs for a short time before the ear muffs automatically shut off their enhanced listening capabilities and return to their full NRR, facilitating safe face-to-face communications in high-noise environments with the simple push of a button. Selective Amplification (aka Speech Enhancement) Ear Muffs are the next step up from PTL muffs. These advanced electronic ear muffs are designed for speech enhancement. That means they selectively amplify sounds in the human vocal frequency range, so voices and other safe sounds remain clear while the user is protected from all other dangerous noises, including both background noise and sudden, very loud impulse noises. 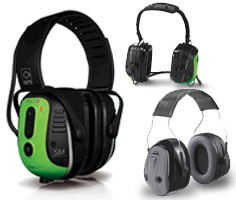 With these electronic speech enhancement ear muffs, workers are able to hear speech clearly and maintain strong situational awareness at all times, while still remaining protected from hazardous noise. You will find both PTL and speech enhancement ear muffs for face-to-face communication below. (NRR 25) Elvex Impulse Level Dependent Mil-Spec Com-655 Electronic Ear Muffs are designed specifically to allow face to face communications in loud industrial environments. (NRR 25) Howard Leight by Honeywell Sync™ Electo® digital electronic FM radio ear muffs with surround sound offer a unique package of features simply not available in any ordinary radio ear muffs. (NRR 31) Razor-X is a neck-worn device that contains two retractable earbuds that block hazardous noise while simultaneously amplifying safe ambient sounds up to 9x. Using Sound Activated Compression (SAC), the Razor-X flawlessly distinguishes and protects against damaging gunfire noise. The neckband is light and stays out of the way, and the earbuds retract in between uses. (NRR 30) Howard Leight Impact Pro Ear Muffs are an electronic industrial hearing protector. They provide both protection from hazardous noise and amplification of safe sounds such as warning signals or co-workers' voices. Comfortable with simple controls. Includes a 3.5mm audio jack. (NRR 26) Pro Tekt 300 Electronic Ear Muffs offer a value-priced alternative with fewer extras you get with the more expensive Pro Tekt models. Still a great set of features, just a lower price. (NRR 26) Pro Tekt Plus Gold Electronic Ear Muffs are ideal for working in close quarters and jobs that require lots of movement. (NRR 28) Pro Tekt Slim Gold Industrial Electronic Ear Muffs offer a lighter weight, slimmed down profile preferred by many workers, especially for extended wear in hot environments. (NRR 25) Etymotic HD15 Electronic Ear Plugs provide advanced electronic hearing protection for workers and industry in a compact ear plug form. Two modes of protection allow you to customize your hearing protection on the fly, offering a balance of natural sound hearing and powerful amplification of quiet sounds, protection from constant hazardous noise, and sudden impact noise protection. NRR (25) SoundGear Instant Fit OSHA Compliant Digital Industrial Electronic Hearing Protection and Enhancement Devices provide a no-compromise combination of both situational awareness and hearing protection for the line worker in industry, oil and gas extraction, processing, construction, logging, logistics, mining and milling, as well as supervisory and management staff who must also function in OSHA regulated high noise environments, yet still remain able to carry on conversations and hear warning sounds. Custom Fit Westone DefendEar Digital Modular Hunting Hearing Aids offer true state of the art assistive listening married to automatic impulse noise protection, and all in a unique modular design.